We have an even more exclusive look into life behind bars, thanks to our extensive library of bartender videos. 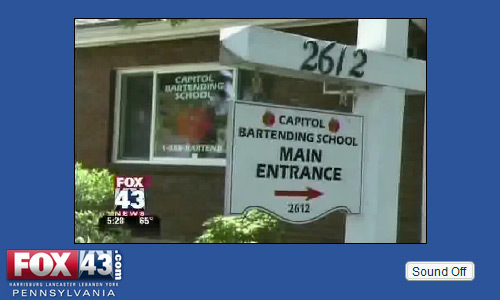 Our Elite Bartending School in Pittsburgh and other reputable PBSA schools have been featured on local and network news channels. Our Harrisburg School was on Local FOX 43! With the economy in a huge recession, and unemployment at an all time high, bartending schools have been the subject of many regional and national news stories. They are unbelievably successful at putting people to work during these difficult times. Our Pittsburgh bartending school is the only bartending school in Pittsburgh authorized to teach the PBSA bartending program!